We don’t have to say much about Wolverine DuraShocks work boots. The numbers speak for themselves. In 20 years, more than 25 million pairs have been sold. Wow. So there you go. Enjoy the rest of your day. In a pair of Wolverine Durashocks work boots, probably. Ah, what the heck. Let’s go ahead and live dangerously and say more. On second thought, that’s exactly the opposite of what you’ll be doing with a pair of Wolverine Durashocks work boots on your feet. Because Wolverine DuraShocks Comfort Technology provides the comfort, durability, and hardworking performance that your job demands. With these on your feet, you can rest assured that your feet will be safe throughout the work day. 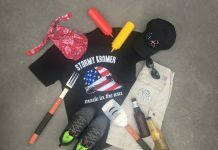 And when you buy a pair of Wolverine DuraShocks work boots from Workingperson.com, you can also rest assured that you’ll be satisfied with your purchase. Not just because these boots are – as we’ve already established – awesome, but because only a proven leader can offer what Wolverine does: a 30-Day Comfort Guarantee. 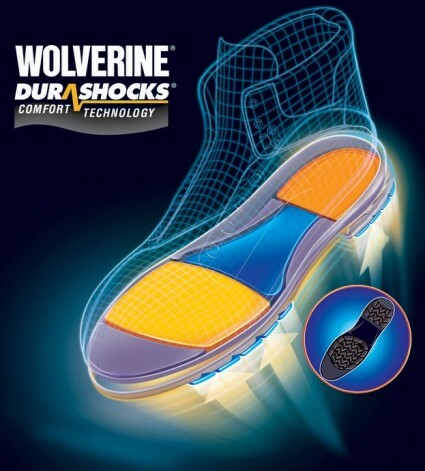 Wolverine has the audacity to guarantee that your Wolverine DuraShocks work boots will be comfortable. The world’s most comfortable boots, in fact. The fact that 25 million pairs have been purchased and, you know, not returned, says a lot. Says it all, in fact. Back to those numbers again. The reason Wolverine can offer this guarantee is for a simple reason. 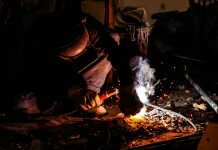 They’re made with the best materials by the most talented craftsmen and tested for the best performance. When that’s the recipe, the result is deliciously satisfying. Here’s how they work: Each pair of Wolverine DuraShocks work boots has DuraShocks compression pads in both the heel and the forefoot of the outsole compress into the outsole itself, which dissipates the forces of weight before they reach the leg and the foot. And the closed-cell polyurethane footbed construction retains their spring for an extended lifespan. The result is comfort, pure and simple. Wolverine DuraShocks work boots are especially well-known for how well they perform for people who wear them at jobs that require a lot of standing. If you’re up on your feet for an extended period of time, fatigue is obviously much greater than a job that doesn’t require that. Wolverine DuraShocks work boots take that weight off better than any other, which relieves the fatigue. That’s why Wolverine can make such a bold statement as it does when it says this: The world’s most comfortable boots. 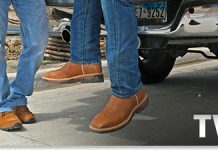 There are dozens of different varieties of Wolverine DuraShocks work boots available on Workingperson.com. So you’re sure to find the pair that’s just right for you. Steel-toe and non-steel toe, and from chukka to cowboy to wellington to good old fashioned traditional work boots.